Includes: 5606-50-X User instructions and Rigid case. The Fluke 5606-50-X full immersion PRTs are designed to perform in extreme environments where both the transition junction and the lead wires are required to withstand temperatures covering the entire operating range of the probe. (“Immersion” in this case simply means exposure to temperatures other than ambient and does not necessarily refer to the medium to which the PRT and its components are subjected). The Fluke 5606 is just two inches (50 mm) in length with a sheath diameter of 1/8 inch (3.1 mm). 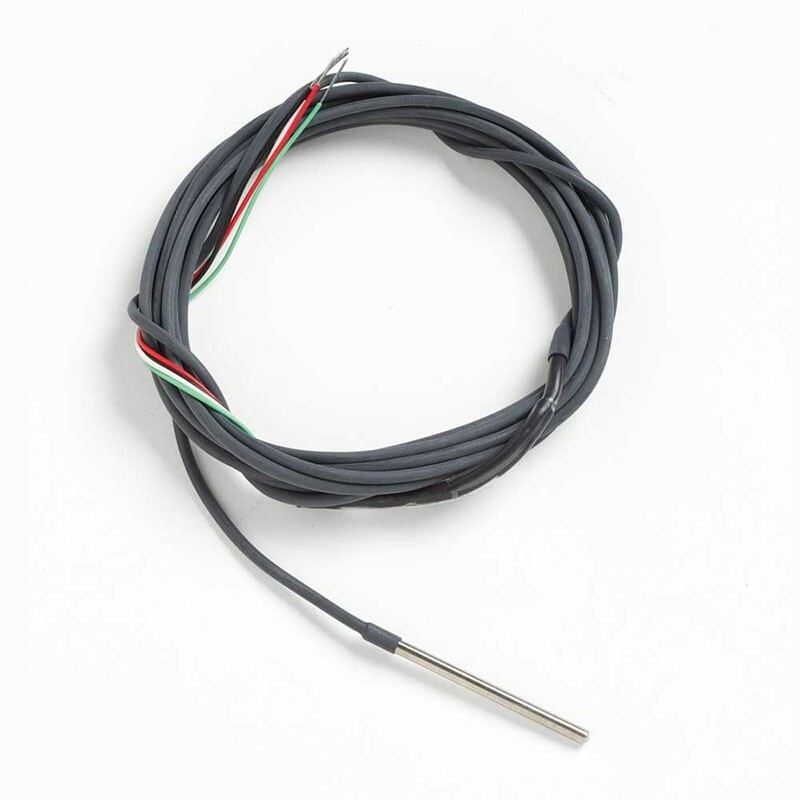 Since it can be fully immersed over its entire temperature range, you don’t have to worry about calculating minimum immersion depth - immerse the entire probe, transition junction, and lead wires, in either non-corrosive liquids or dry mediums ranging from –200 °C to 160 °C. In order for any instrument to be used as a standard it must be calibrated. These instruments are sold uncalibrated unless calibration is requested at time of purchase. They are satisfactory as secondary standards and may be calibrated by comparison to primary standards. 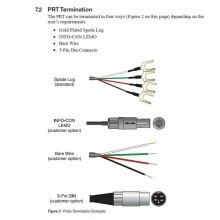 Please Note: When ordering please specify the termination you require. ie. Fluke 5606-50-G (gold pins). Specify “A” (INFO-CON for 914X), “B” (bare wire), “D” (5-pin DIN for Tweener Thermometers), “G” (gold pins), “I” (INFO-CON for 1521 or 1522), “J” (banana plugs), “L” (mini spade lugs), “M” (mini banana plugs), “P” (INFO-CON for 1523 or 1524), or “S” (spade lugs). 5606: -200 °C to 160 °C. Calibration accuracy of ± 0.05 °C. Transition junction and lead wires can withstand full PRT temperature range. Unique probe seal of 5606 prevents ingress of moisture. Calibration not included; NVLAP-accredited calibration optional. Temperature range –200 °C to 160 °C. Nominal resistance at 0.01 °C 100 Ω ± 0.1 Ω. ± 0.06 °C at 160 °C. ± 0.04 °C at 160 °C. Sheath length 50 mm ± 5 mm, (2 in ± 0.2 in). Sheath diameter 3.1 mm ± 0.1 mm (1/8 in ± 0.004 in). Transition junction temperature range –200 °C to 160 °C. 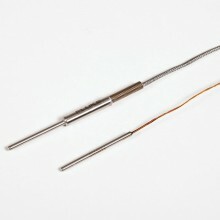 Sensor length 30 mm ± 3mm (1.2 in ±0.1 in). Sensor location 3 mm ± 1 mm from tip (1.2 in ± 0.04 in). Minimum insulation resistance 20 MΩ at 23 °C. Minimum immersion length Full immersion. Maximum immersion depth in liquid medium Full immersion. Response time 12 seconds typical. Self heating (in 0 °C bath) ± 0.003 °C. Lead-wire cable type Enameled copper wire. Lead-wire length 2.4 meters (8 ft). Lead-wire temperature range 160 °C. Calibration Calibration not included. NVLAP accredited calibration available. See ordering information. PDF Specifications of the Fluke 5606 & 5607 Full Immersion PRT's.